I was born on a small houseboat in one of the canals in the city of Leiden, The Netherlands, in 1961. As a very young child I loved painting and drawing. Although I promised my schoolteacher that I would go to art school, my parents could not see any reason why I should go. In their eyes it was just some kind of folly. Therefore, at the tender age of 16, I started to work as a painter of earthenware, the famous 'Delft Blue', which felt as a nice alternative to me. Some years later I moved to Rotterdam, where I worked in a bookshop (specialized in architecture), while in the evenings I studied graphic design. In 1996 I started the company "Nothing Els" for illustration and design. I designed book covers, company logos and all sorts of advertisement brochures. Although the design work was fun and satisfying, my inner self wanted to paint, so in my spare time I started to pick up paint and brushes. One day I met the Dutch master painter Cornelis Le Mair. To my delight he took me on as one of his students and during five successive years I followed his masterclasses each summer. In between I took painting lessons as well. Six years later we moved to Denmark. We 'burned our bridges' and the design work came to a halt. This, however, enabled me to focus completely on painting. During the three years we lived in Copenhagen my work was exhibited several times and based on this success the ï¬rst commissions started to come in. I also started to teach. It felt good to share my painting knowledge. Although I have never stopped learning myself! For a short while we lived in Barcelona, Spain, and in 2006 we moved to Italy. Here we still work and live. In Florence I studied model painting and the technique of Caravaggio at the Angel Academy of Art. After we bought an old and neglected house in the province of Umbria, an extensive renovation-period started and no time (nor energy) was left to paint. In 2012 I started giving some painting courses and soon after I was painting again. Finally I could turn my mind completely to the things I loved to do. In the autumn of 2014 a solo exhibition took place in Vatican City, in the Church of the Friesians. It felt like a brand new start! I work in a lovely bright and spacious studio, which is surrounded by green hills with peaceful olive groves and vineyards. 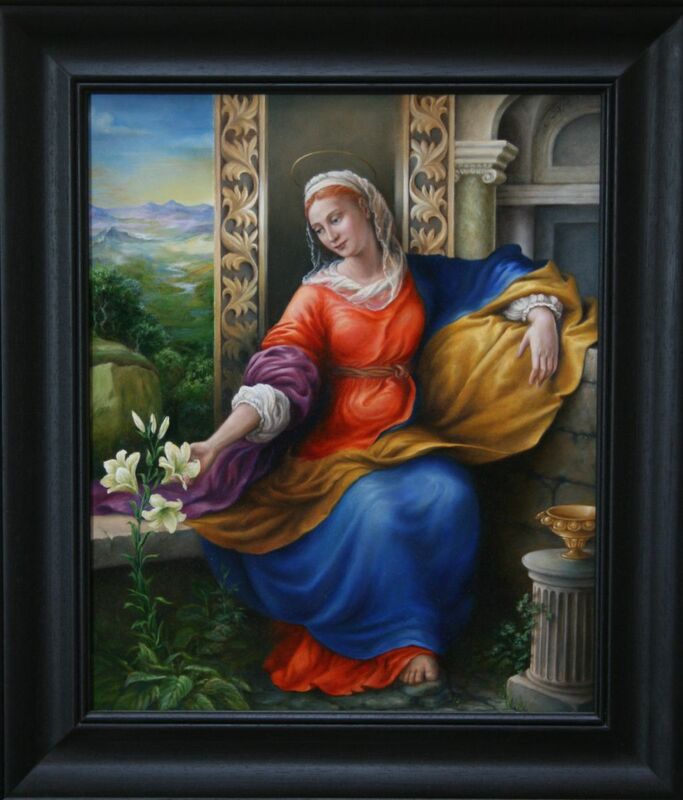 I paint in oil, in a classical, realistic and figurative Baroque-like style. No doubt I am inï¬‚uenced by the Old Masters whose work I greatly admire. I use the 'glazing' technique developed in the 16th and 17th centuries: a process of many layers of oil paint on canvas or panel that often takes months to complete. My heart goes out primarily to the portrait, although I have painted still lifes and an occasional landscape as well. All my work is made with a life model or a person sitting for a portrait. An exception are two studies of existing paintings, which were valuable painting lessons for me. As a help I use series of photographs I make of the model or sitter. In case of a still life, the objects are in front of me. I am happy to receive portrait commissions and the works are for sale. Painting is a form of language, which just a like a book or music can tug on your heart strings. Perhaps this is because an artwork is more than the total sum of its materials, colours, technique and style. Mysteriously, something of the maker seems to shine through, besides craftsmanship, talent and passion. It is my profound wish to visualize the spirituality which is so important in my life – to intrigue my audience and invite viewers to look and read! 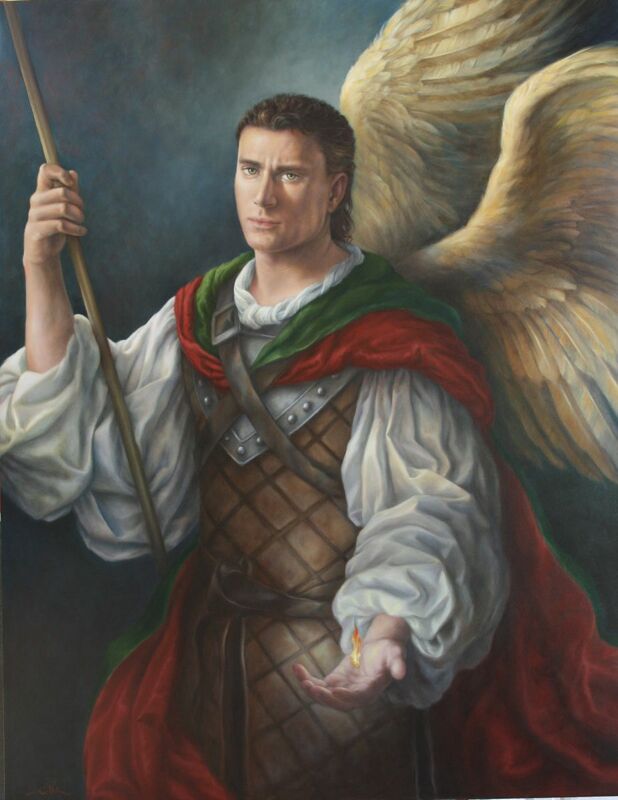 SAINT MICHAEL, oil on panel, 122 x 96 cm. The mighty Archangel, who has holy signiï¬cance for Christians, Jews and Muslims. His name means 'Who is as God? ', in his hand he holds a soul - represented by a ï¬‚ame - to be 'weighed'. SAINT MARY MAGDALENE, oil on canvas, 38 x 47 cm. This work was inspired by the question: what are we made of? On the left you see nature, on the right men-made structures and in the center the apostle of apostles. 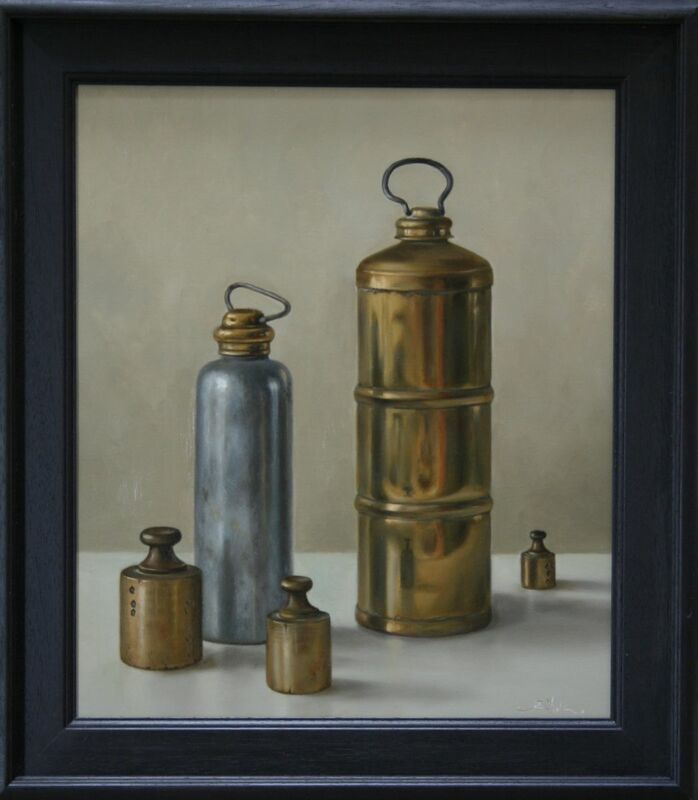 STIL LIFE WITH METAL, oil on panel, 44 x 50 cm. The copper hot water bottle is from my family, the other objects I have collected.